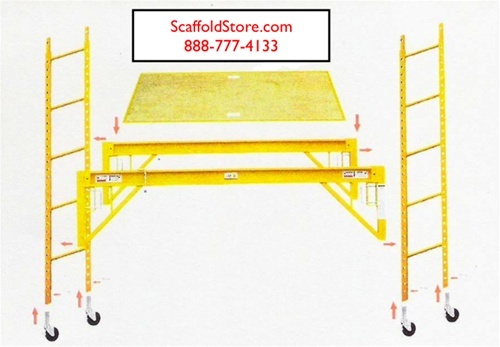 * MAXIMUM HEIGHT IS: 11'4"
This MFU comes unassembled in a box and is very easy to assemble and takes little space to store. Perfect for: *Painting *Sheet Rock/Dry Wall Applications *Wall Papering *Electrical Work *HVAC (AC/Heating) Work *Use in hallways, stairwells and door openings. LOCK CASTERS BEFORE MOVING! DO NOT RIDE ON SCAFFOLDING! DO NOT USE A LADDER ON TOP OF THIS SCAFFOLD! 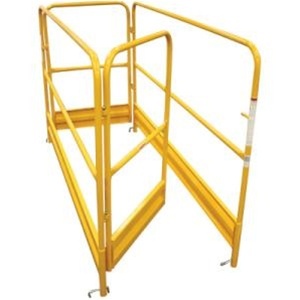 Guard Rail Assembly attaches to the deck (it will move with the work platform).